Below are the Matric Results for Tsogo Secondary school for the year 2017. The information has been gathered from multiple sources and is referenced as such. The information will be updated throughout the day as more sources become available. Tsogo Secondary had a total of 135 students who passed out of 139 (97.1%). Of those who passed, 79(+7 from 2016) Obtained pass with Admission to Bachelor Degree , 40(-4) with Admission to Diploma and 16(-2) with Admission to Higher Certificate. Below are the Matric Results for Tsogo Secondary school for the year 2016. The information has been gathered from multiple sources and is referenced as such. The information will be updated throughout the day as more sources become available. 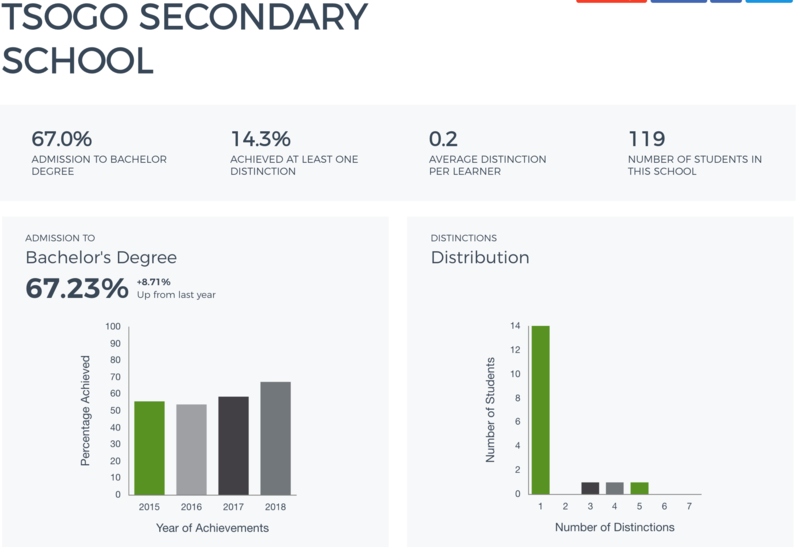 Tsogo Secondary had a total of 134 students who passed out of 139 (96.4%). Of those who passed, 72(+4 from 2015) Obtained pass with Admission to Bachelor Degree , 44(+1) with Admission to Diploma and 18(+7) with Admission to Higher Certificate. Below are the Matric Results for Tsogo Secondary school for the year 2015. The information has been gathered from multiple sources and is referenced as such. The information will be updated throughout the day as more sources become available. Tsogo Secondary had a total of 122 students who passed out of 127. 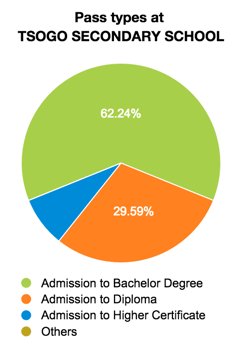 Of those who passed, 68(+7 from 2014) Obtained pass with Admission to Bachelor Degree , 43(+14) with Admission to Diploma and 11(+3) with Admission to Higher Certificate.